Get started on the path to your new career by taking our Alabama Real Estate Commission approved real estate Salesperson pre-licensing course with the confidence of knowing that you will get the education you need At Your Pace Online. If you have any questions our world class customer service team is here to help, don't hesitate to call us at 1-877-724-6150. 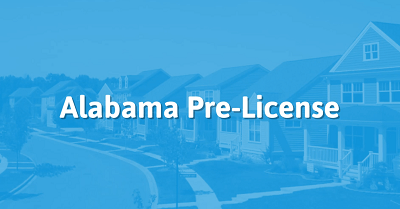 We are a Alabama Real Estate Commission approved pre-license education provider (Provider ID 109278). Being a U.S. citizen, permanent resident alien, or legally present in the U.S. Complete an approved 60 Hour Salesperson Pre-License course. This 60 hour course will prepare students to take the Alabama Licensing Test for Real Estate Agents. It covers all of the topics addressed on the test, and quizzes students periodically to ensure retention of information.